Career achievements: Web.com Tour Rex Hospital Open 2017 Champion. 3 mini-tour wins. 2009 NCAA Team National Champion. Career low round: 62 (-10) in competition. Number of Aces: 4 (one of which was in the 62. Favorite hobbies other than golf: Pistol shooting, fishing, Texas A&M Athletics. Standing next to the open liftgate of his GMC Denali on a cold morning at Vaquero Club in Westlake, Conrad Shindler prepares for another day of practice, another day of getting better, another day grinding. On this morning, Shindler has a scheduled bunker lesson with arguably one of the best sand players in the history of the game, K.J. Choi. An opportunity he seemed to be genuinely grateful for. Shindler has always loved golf. 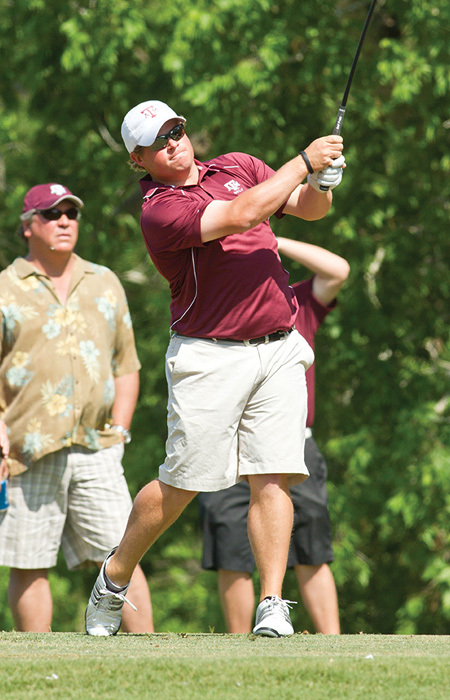 Since the time he first picked up a club, to winning a National Title as a member of the Texas A&M Golf Team in 2009, to the Adams Tour, to the Web.com, and last year as a member of the PGA TOUR, he’s put his heart and soul into the game. Although at just 5’8’ and around two-bills, he doesn’t fit the modern mold of the workout-warrior, sleeve-busting hulkamaniacs like Brooks Koepka or Tiger Woods, length and power have never been an issue. He might not bust it with 350-plus carries on the reg, but he hits it plenty far enough. The putter can be streaky, as can the short-game, but find me a golfer who has ever picked up a club who hasn’t dealt with the same. It so often simply depends on how long the cold streaks last and whether the hot streaks are warming springtime sunshine for just a few holes, or white-hot meteor blazing and last for rounds at a time. In reality, Shindler is a master of his craft. He spends hours working on his game with every device he can get his paws on. From a Trackman, to alignment sticks to, on this morning, K.J. Choi. In a round with him at Colonial last month, I watched him pull out a compass to determine wind direction. In that round, he shot 71 in a 25 MPH north wind while having to lug around three hacks for 4 hours. Point being, the kid works, and he’s in the top one percent of golfers on the planet. Despite that, Shindler is still grinding month-to-month. After a year on the PGA TOUR in 2018, Shindler finds himself back on the Web.com in 2019. Don’t get us wrong, most people would kill to be able to play golf for a living, but the common misconception remains that being a professional golfer means private jets, Wagyu steaks the size of a manhole cover, Stoli Elit Martini’s and a team with as many members as a modern NASCAR pit crew. In reality, the mini-tour grind means commercial air travel, a quesadilla in the hotel restaurant, a Tito’s and Topo Chico and traveling with your caddy, who may or may not be replaced every three months. To help our readers understand the grind, Conrad sat down with AVIDGOLFER for a candid interview about what the game means to him, the rigmarole of life on the road and the differences between the mini-tours and the biggest stages in the world. AVIDGOLFER: What got you started playing? Conrad Shindler: My dad would take me to the course as a young kid. My mom always told him he could go play golf, but he had to take me along so I wasn’t always having to be at home with her. I was quite the hellion as a kid. AG: When did you (or your parents) know that you had a talent for the game? CS: I think they knew from a pretty young age simply because I fell in love with the game so fast. It was all I wanted to do on a daily basis, so it was pretty apparent from an early age that I wanted to be a golfer. AG: How was your high school career? CS: My high school career was pretty good. I won over 10 high school events and 2 AJGA events. That kind of got me in the national spotlight to earn a scholarship. AG: You chose to attend Texas A&M. Were you always an Aggie? CS: Not even close. I grew up always wanting to go to UT. Both my parents went there and that was the only place I wanted to go. But when the recruiting letters came in, A&M pushed very hard. I went on a recruiting trip and instantly fell in love with the place. AG: You won a team National Championship in 2009. At the beginning of that season, did you feel like that was even a possibility? CS: We knew we had really good team chemistry and talent. It was the first year they had match play to determine the champion, so our goal was just to get into the top 8 and then it’s game on. I strongly believe we won because we had so much confidence in our teammates that you felt everyone had your back and would pull through for one another regardless of the situation at hand. AG: Obviously, you’re a big Aggies football fan. What’s your favorite Aggies football moment? CS: I was in Tuscaloosa when we knocked off #1 Alabama. It was absolutely the most unbelievable thing I’ve seen in person that was Aggies sports related. CS: Nope. I don’t have any. AG: In 2013, you got your first pro win on the Adams Tour. Your earnings were $15,000. You donated every cent to the victims of the Moore, Oklahoma tornado disaster that had happened days earlier. What was your thought process behind that decision? CS: I remember getting home after my practice round and seeing the destruction on TV. Seeing an elementary school in ruins, I was heartbroken. I knew they needed the money, whatever money, more than I did. So I made the decision to give whatever I won to the elementary school I saw on TV. I was incredibly honored to drive up I-35 to Moore, OK to donate that check. AG: So, we need to talk about the differences between the mini-tours and the PGA. Without getting too specific, what expenses do you pay when you travel to the Web events vs. PGA events? CS: Honestly, they’re not very different. Our breakfast and lunches are always provided for us on both levels, you still pay for your hotel and airfare, but on the PGA TOUR we have courtesy cars so you’re never having to deal with renting a car while out on the road. That definitely is a great perk to have. AG: Courtesy cars are always a nice perk. Was there one that stuck out as a favorite? CS: At the RSM in Sea Island, GA we had these super nice BMW’s. I don’t remember what kind it was but I remember googling the price to see it creep over 6 figures. I remember it took me 15 minutes to just learn how to connect my phone to the Bluetooth. But this thing was fast and fun to drive. However the speed limit all around Sea Island was only about 35, so I never really could cut it loose. AG: If you could pick just one of the four majors to play, which one would it be and why? Do the venues matter? For example, I think most pros would pick the Masters over an Open championship at Royal Portrush, but they might choose the British if it were at St. Andrews. CS: For me it is definitely the Masters. For Americans, it’s just such a special place. You have all the visions of making the putt on 18 to win the green jacket. I just don’t think there is anything better in the game. AG: Hypothetical: You get a sponsor’s exemption to a TOUR event this year and win. What’s the first thing you’re buying with the winnings? CS: A new house. The house my wife and I have had since we have been married has been so special to us, but we are just looking for something a little bit bigger. Especially when we start having some kids. AG: Best and worst travel story? CS: Best was last year coming home from Reno. I was lucky enough to score a seat on a private jet home. That will spoil you in a heartbeat. You’re on the plane in about 5 minutes. When I got home, my father-in-law was waiting on the tarmac. Took about 5 minutes to get my clubs and bags, and we were on the road. The worst was when I was playing on the OneAsia Tour. I was on way home from Fiji and I was stuck next to a mother with a lap infant on a 10-hour flight. Needless to say, the diaper was starting to smell pretty bad halfway through. AG: What are the worst things about airports? CS: I would say waiting to check-in and waiting for bags. We are always checking luggage. I would hate to see how much time I have spent waiting on baggage over the years. AG: How many times have your clubs not arrived at your flight destination? CS: Just once. And it was while I was on the PGA TOUR. They showed up the next day, which was fine. I’ve been pretty lucky compared to some others. AG: The difference in number of equipment vans/haulers at PGA TOUR versus Web.com Tour events. CS: On the tour every company has their own trailer, so you might see 9 or so trailers on tour. On the web, 5 or so companies work out of the same trailer, so we might only have 4 or 5 on the Web.com. AG: What’s the last piece of golf equipment/apparel you had to buy? CS: I’ve been in some funky situations were a freak cold front has moved through and I’ve had to buy some new weather gear. It happens a lot more than you think. AG: What do you pack for a 3-4 straight week travel schedule? CS: A lot of it is weather dependent, but you’ll pack 8 or 9 shirts and pants, rain gear, socks, underwear, jackets potentially, then all your workout gear and your casual attire. If I can keep my suitcase under 50 pounds, it’s a minor miracle. AG: Biggest difference between Web.com and PGA TOUR skills? CS: Short game. Guys on the PGA are wizards. I’ve seen guys hit it so bad and shoot 67, it’s just unreal how good guys can get at chipping and putting. They can get up-and-down from anywhere. AG: Is the Monday Qualifier the toughest round in pro golf? CS: It’s really just a crap shoot. Go fire at 18 pins and pray. I’ve shot 66 and missed by 3, I’ve shot 69 and qualified. You just never know what you’re going to get. 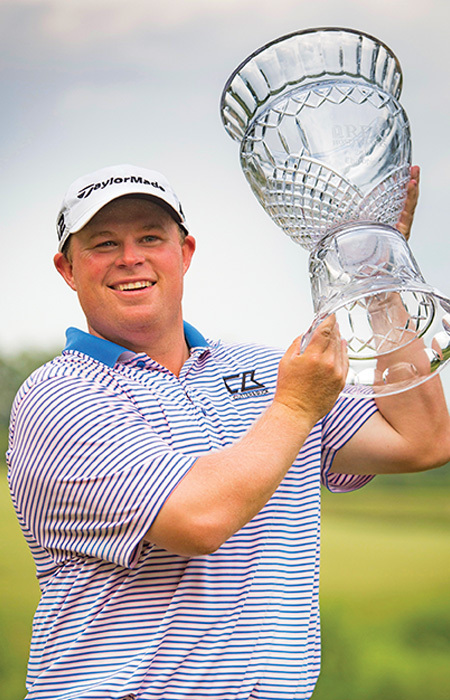 AG: Surprise experience you weren’t prepared for when earning PGA TOUR card? CS: I would say all the extra benefits within the tour. Transportation services, discounts, there are a ton of bonuses to getting that PGA TOUR card. AG: Best advice your seasoned Tour friends gave you? CS: This one came from Todd Hamilton. He said NEVER hit a shot until you are 100% ready. There is a lot of moving distractions on tour, so you back off a fair amount of shots. AG: Are you an avid golf watcher? CS: Really only with the majors. I’ll check up on the leaderboard but I really don’t watch a lot of TV coverage. AG: If you weren’t a pro golfer, what would you likely be doing? CS: I’ve always been a fan of the sports media. I always thought it would be really cool to travel with a team and get to experience all they have to offer within their season. So, maybe a beat writer or something like that. AG: You’ve had the chance to pop on Sportsradio 1310 The Ticket in Dallas a few times. What about a career in broadcasting? CS: I would be so down for that. To get to just talk to make money? I can’t think of anything more up my alley. AG: What is your favorite go-to shot? And let’s say your game maybe is struggling a little bit, what’s the one shot you would feel confident about. CS: My consistent go-to shot is a pull-fade. It’s pretty reliable for me. I can always lower the trajectory and hit a guaranteed cut, so if I have to that’s what I’ll go-to if things are in a bit of a bind. AG: Favorite and oldest club in bag? CS: My irons have been in the bag the longest. Since about May of 2017. Srixon Z765’s. They’re perfect for how my irons interact with the turf. AG: What was the oddest endorsement request after earning your Tour card last year? CS: Nothing really odd. I’m pretty independent so I haven’t gone hunting for many outside the box deals. AG: If you could replace one skill with that of a current or past player, what would it be? CS: I would love to have Corey Pavin’s short game. AG: First change you’d make if named Tour Commissioner for a day? CS: A bigger and more consistent purse on the Web.com Tour. 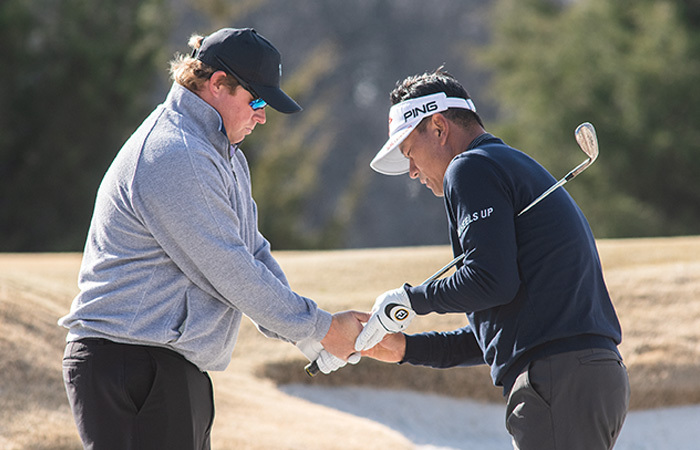 AG: How often do you have lessons with your swing coach? CS: It just depends, you know? When things are good you just want to keep that momentum flowing that you’ve created on your own. But when things get going south you want someone to get eyes on you as fast as possible. So, if I had to put a number on it, I would say once every 3 weeks or so. AG: Most overrated part of being a Tour pro? CS: The fact you travel for work. Most people think that we get to travel to these exotic places and it’s all fun all the time. The reality is spending more time in hotels than your own home can really wear you down. AG: You’ve been married for a little over a year now. How hard is it being away from your wife and family for extended periods of time? CS: It’s definitely tough. She’s my best friend and my number one fan. When you don’t have them by your side it can definitely be draining for the both of us. But we love each other so much and we cherish the time we spend together. AG: Okay, it’s a cliché golf question, but who would be in your dream foursome? CS: Tiger, Ben Hogan, Arnold Palmer and my dad. I don’t even want to play, I just want to watch. My 3 favorite players and the man who showed me this great game. That would be such a treat for me.